Universal PCI industrial card now with 8 ports available! 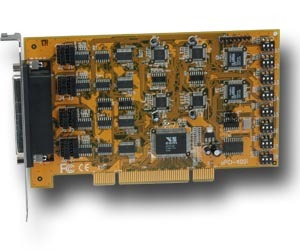 October 10, 2006 - Vision Systems GmbH, announces the release of the 8-port version for the industrial line universal PCI cards. The industrial line UPCI cards are designed for industrial communication. The three-way serial interface features standard RS232 ports, RS422 ports with hardware flow control and RS485 ports with several operating modes. With RS485 the data direction is controlled by ART (Automatic Receive Transmit control) technology. Your software doesn't need any changes. RS422 and RS485 enable transmission on long distances up to 1000m which may require optical isolation and surge protection. The optical isolated version even provides isolated RS232 ports as it may be necessary in medical monitoring environments. The 16C550 type UARTs make the industrial line cards an excellent choice for all systems. The compatibility options enable usage even in rare software environments, different from Windows and Linux. The maximum serial speed of 921.600 bps allows high speed data transmission and many intermediate parameters. Detail Specification | Inquiry this product: Art No (4441).